Today I’m so excited to have as my guest, Sharon Jaynes, a conference speaker, author of 21 books, and devotion writer for Proverbs 31 Ministries and Girlfriends in God. Her latest book, A 14-Day Romance Challenge: Reigniting Passion in Your Marriage, includes over 250 ways to romance your man. She’s been romancing her husband, Steve, for 37 years. They call NC home. Did you ever wonder why there wasn’t a second verse? I think a lot of husbands do. I’ll admit, when my son, Steven, came into the world, it was a challenge not to pour all my energy and attention into that little bundle of love that held my heart in his tiny hand. I think there were times when my husband wondered where he fit in once our first child was born. And he’s not the only guy who’s felt that way. Rob Parsons, author of The Sixty Minute Marriage Builder, wrote about the adjustment his marriage went through after the birth of their first child. A mother should never feel guilty for putting her husband before her children. I grew up in a very volatile home where my parents fought on a regular basis. They vacillated between heated arguments and passive-aggressive silence. I felt like our home was teetering on a fault-line and I never knew when the big one was going to hit. There were many. As a child, I would have given anything to know my parents loved each other—that my daddy was Mom’s priority and my mom was his. When I was six years old, my favorite aunt took me shopping to buy my mom a present, and I picked out a very revealing nightgown. Everyone got a big laugh out of my selection. But in my little girl heart, I thought that if my mom wore the nightie, then maybe dad would like her. Then maybe she would like him. And maybe everything would be OK.
Security. That’s what I wanted. So when my son, Steven, was born, I wanted to make sure that he knew that his mommy and daddy were crazy about each other…and always would be. Obviously, a child requires more time and energy than a grown man, but a skillful wife assures her guy he is still number one in her heart. Here are a few ideas from my book, A 14-Day Romance Challenge: Reigniting Passion in Your Marriage, to let your husband know that he’s now an afterthought, but still holds the key to your heart. Text your husband a love note with a hashtag such as #crazyaboutmyman, #crazyinlove, #hunkyhusband, or #happywife. Purchase a bottle of the cologne he wore when you were dating and give it to him as a surprise. Just the idea that you remembered it will stir his heart. He’ll feel like Romeo just putting it on. Go by his workplace and slip a “ticket” under his windshield wiper. Write the following: “You have been cited for being the most amazing man in the world.” Sign it, Officer (your name). Plan a date night at your favorite restaurant or even an overnight in a hotel. 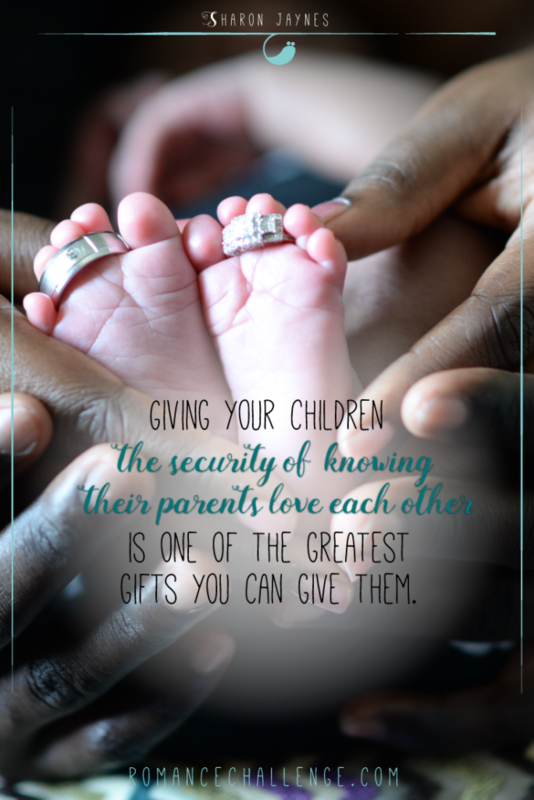 Give your husband a note that says, “I want you all to myself.” Don’t talk about the kids for at least 24 hours. 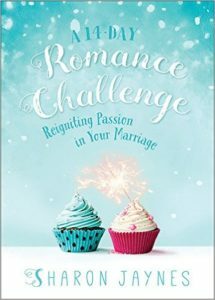 Sharon would like to send a copy A 14-Day Romance Challenge: Reigniting Passion in Your Marriage to one of my readers! This contest is over and the winner is Lynne who posted February 8, 2017 at 8:40 a.m. Thank you to all who participated! 1 Rob Parsons, “Don’t Let Your Baby Drive You Apart,” Focus on the Family, February 1998, 12. It is so easy to put everything before our husbands….work, kids, friends. This is a great reminder of how special and important the husband/wife relationship is to our families. Can’t wait to read the book. to make him feel special and know that I appreciate his hard work and long hours, I sit with the kids for their (earlier) dinner, but I wait to eat my dinner – with him ! He knows this is big because I am starving by the time he gets home!! I love this selfless gesture, Christine! My husband is my first hello and my last goodbye. I am a big believer that your husband needs to be cherished above any children, and believe me, I cherish my children and grandchildren. There is never any doubt in my husband’s mind that he is the love of my life. Even after being married for several years, he is the one I want to spend time with – no matter what we are doing. We always touch when we are together, and kiss hello and goodbye. His favorite gift from me was a list of 100 reasons why I love him. He keeps it with him at work. He’s told me that he pulls it out and rereads it whenever he has a bad or difficult day. This is especially hard when he is the child’s step father. And making time for both of them evokes hurt feelings on both sides. I am working very hard to be everything to everyone and every day I pray God helps me show everyone they are important to me. To make my husband feel special,I want to plan a special weekend away to focus on just the two of us. The k you got the give away.